I was lying in bed, about 2 minutes from calling it quits tonight when SOMEONE (::cough,cough:: Darren Dreger:: cough, cough::) decided to drop an atomic bomb on 2 fanbases at 12:49 a.m.
Yeah…. cue the heart attacks. Dave Poile, the Preds GM, has had the horrifying habit of letting his players walk away with little fight. Suter said “See ya”, Radulov said “Dasvidaniya”, and now this could be THE franchise player leaving for. er, orangier pastures. ALL are still unsigned. ALL are younger than Weber. ALL would except a smaller payday. Let’s keep in mind, however, that they are RFAs and their teams would need something in return. What could Poile possibly offer? Oh yeah, Philly’s draft picks. This financial freedom could also allow him to refurbish his front lines with a couple of shiny new toys, i.e. Jamie Benn, Shane Doan, Kris Versteeg, Matt Martin… you get the idea. OR trade for any other forward in the game with his 1st round picks! Although this transaction could potentially throw the makeup of both of these teams into chaos (not to mention the mental states of their fans), either or both of these teams could fare better in the future as a result. This is not an easy decision for Poile to make. 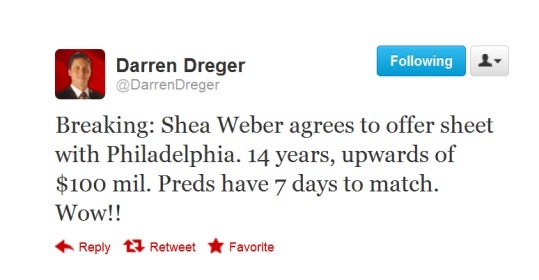 One thing is for sure, by this time next week, Weber will be sleeping soundly, tucked into a mega contract in one of the most heinous jersey colors to ever exist. Make that three fanbases. I’m a Penguins fan and let me tell you, I’m none too happy about this.